India's powerful new GSLV Mk III rocket launches the GSAT-29 communication satellite on Nov. 14, 2018. India's most powerful rocket aced its second orbital flight Wednesday (Nov. 14), setting the stage for a robotic lunar mission in January. The Indian Space Research Organization (ISRO) launched the Geosynchronous Satellite Launch Vehicle Mark III (GSLV Mk III) from the Satish Dhawan Space Centre in Sriharikota at 6:38 a.m. EST (1138 GMT) Wednesday, successfully delivering the GSAT-29 communications satellite into orbit. The GSLV Mk III's first orbital test launch, in June 2017, was successful as well. The ISRO also launched an experimental version of the GLSV Mk III in 2014 to test a prototype of a space capsule built to carry three astronauts into space. That mission also succeeded, but it was a suborbital, not an orbital test. Following the success of Wednesday's flight, Indian officials declared the rocket ready for operational flights, beginning with the launch of the Chandrayaan-2 lunar lander. That liftoff is currently scheduled for Jan. 30, according to Spaceflight Now. Chandrayaan-2, India's planned second robotic mission to the moon, consists of an orbiter, a lander and a rover. It is a follow-on mission from the Chandrayaan-1 orbiter, which in 2009 helped confirmed the presence of water ice on the lunar surface. 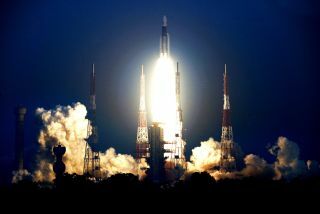 India plans to launch Chandrayaan-2 from the Satish Dhawan Space Centre. The GSLV Mk III is an upgraded version of India's GSLV Mk II and can haul about double the payload of its predecessor. The new rocket will also be used to launch India's planned Gaganyaan crewed spacecraft into orbit as early as December of 2021, according to Spaceflight Now. Over the next few days, three orbit-raising maneuvers will be performed to position the 6,913-lb. (3,423 kilograms) GSAT-29 satellite in geostationary orbit about 22,000 miles (36,000 kilometers) over the equator. GSAT-29 "is a multiband, multibeam communication satellite, intended to serve as test bed for several new and critical technologies," according to the ISRO. Specifically, the satellite's payload includes a high-resolution camera and optical communication technology. This tech will use laser communication links to relay information between the ground and geostationary orbit significantly faster than conventional radio communications can. The launch of GSAT-29 "will help to bridge the digital divide," K. Pankaj Damodar, GSAT-29 project director, said in the same statement. "Several next-generation payload technologies will be demonstrated with this mission soon." Chandrayaan-2's launch won't be the next liftoff from Indian soil. That should come on Nov. 26, when the nation's Polar Satellite Launch Vehicle lofts the Hyperspectral Imaging Satellite and multiple secondary payloads for the U.S. and other international partners.